Your INFINITI is designed to perform at the highest levels… to push your limits and create a more empowering drving experience. That’s why we only use high-performance synthetic oil and high-performance, INFINITI brand oil filters, as these components can help maximize your vehicle’s performance. In addition, every oil change is performed by a highly trained technician who will also conduct a complimentary multi-point inspection. When you bring your vehicle in for service, you can rest assured that we only use Genuine INFINITI oil filters that are designed specifically for your vehicle. Each oil filter is engineered with an anti-drainback valve that keeps the oil in the filter when your engine is off, which prevents harmful engine wear when you start your vehicle’s ignition. One of the easiest ways to help extend the life of your INFINITI is to protect its engine with regularly scheduled oil and filter changes. Engine oil reduces wear and tear by providing a lubricating barrier between each of the moving engine parts. Meanwhile, a high-performance oil filter can help extend the life of your oil and your vehicle by capturing contaminants and reducing engine-damaging oil sludge build-up. 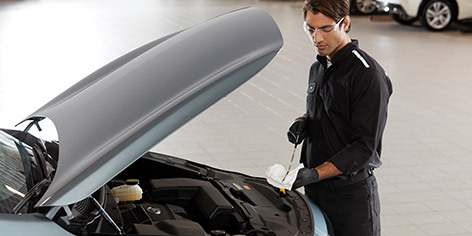 When your INFINITI is in need of an oil change, we invite you to visit any of our Retailers. You can schedule an appointment by simply calling your INFINITI Retailer today to reserve a time that works best for you. Or better yet, some INFINITI Retailers offer Express Service or Online Service Scheduling for even greater convenience.